Spring is coming. Are you wishing you had a nice deck to sit outside and enjoy it on? Getting a deck installed doesn't have to be an arduous task. In addition, it can bring a nice return on investment. Adding a deck will give you an average 77% return on your investment, depending on where you live and the size of your deck, according to the 2013 Cost vs. Value Report from Remodeling magazine via HoueLogic. Composite decking (Trex, EverGrain, and TimberTech are some well-known brands) makes great sense from a maintenance point of view but will be more expensive — composites cost about 45% more than pressure-treated wood—and will recoup an average of only 67.5% of your cost. If you own an upscale home, a more elaborate deck may be appropriate to keep pace with the competition, but don’t expect a premium payback: A two-level, 400-sq. ft. deck with upscale features such as composite decking, decorative railings, and built-in lighting offers only about a 59.7% payback. Hankering for an even higher return? If you’re reasonably handy, you might want to go for the gold and build the deck yourself. Labor costs typically make up more than half the cost of residential construction. That means you can spend as little as $4,000 in materials for a wood deck of mid-range size and come away with a resale value of more than $8,000 — a handsome return. However, plan on spending 4–6 weekends building a 16x20 foot deck yourself. If you choose this route, consider buying a ready-made deck plan. Or, put to use one of the many websites with interactive design aids, such as Lowe’s Deck Designer (registration required), and Deckorators. 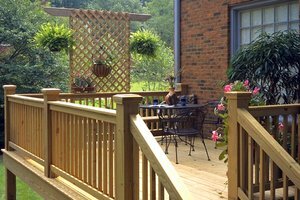 Exterior Specialties of PA is here to help with all of your pennsylvania deck building, deck installation, deck repair and deck inspection needs. Call us today at (215) 453-9180 for your FREE estimate!